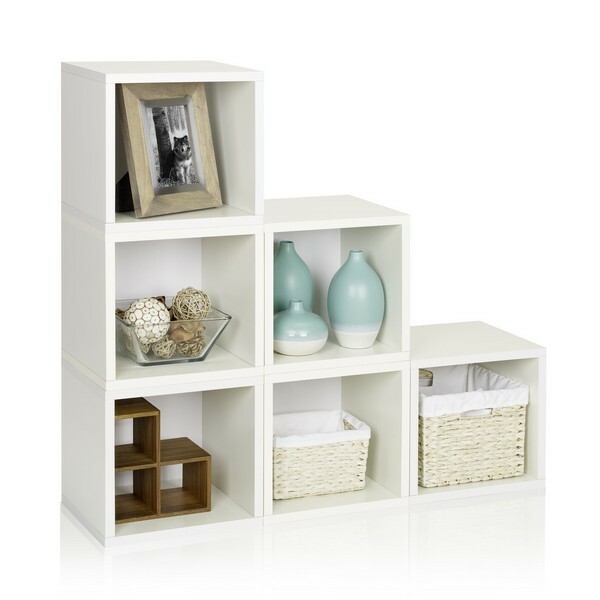 Get Rid of Clutter in Style with The Way Basics Storage Solutions! I received a 6 Modular Cubes for this review. I was not financially compensated for this post. My opinions are my own and not by any means influenced by any other part. One of the biggest issues I have at home is storage space and organization and now that the baby is here, that issue is even more obvious as little ones manage to take up a whole lot of space. 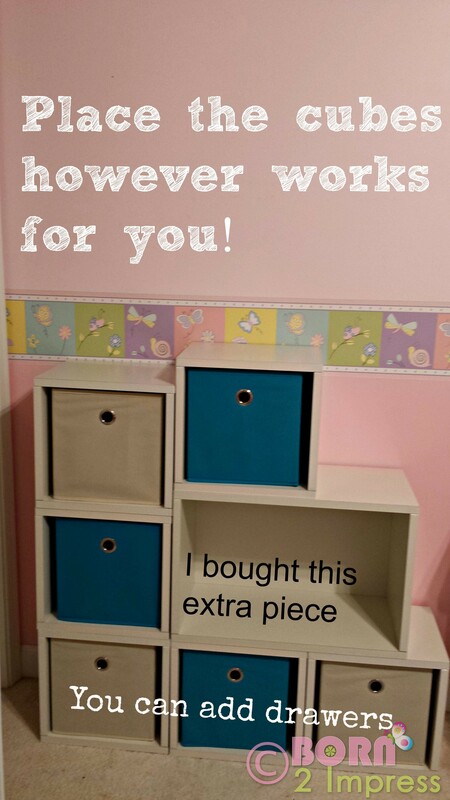 Needless to say trying to find space for diapers, toys, clothes and all the fun stuff for the baby, has proven to be quite challenging and I needed to create some extra storage space in my daughter’s room to control/ manage the clutter. Way Basics offers you the perfect solution to most of your store and organizational problems. Made from zBoard, a recycled paperboard that’s just as strong as particle board, yet 62% lighter, Way Basic storage units allow you to design your space whichever way you want. Their units are as easy to create as peel, stick and done! You do not need any tools to assemble the Way basics zBoard storage products, yes; they are tool free and hardware free. You can create a storage system in a matter of minutes and better yet, you are the one to decide the way that the unit is going to be as Way Basics gives you the power to design your own storage unit! All you need to do is go to their website and look at their catalog and decide if you want one of their designs or you want to make your own…This is what I really like about this brand…They have different cubes, and rectangles that will allow you to play around with the designs and ultimately create a storage unit that is fitted to your needs. For this review I was sent the 6 Modular Cubes in white ( they offer different colors which is another plus), which is basically 6 individual cubes that you can choose to configure in any way you decide…the beauty of it? The simplicity and ease. 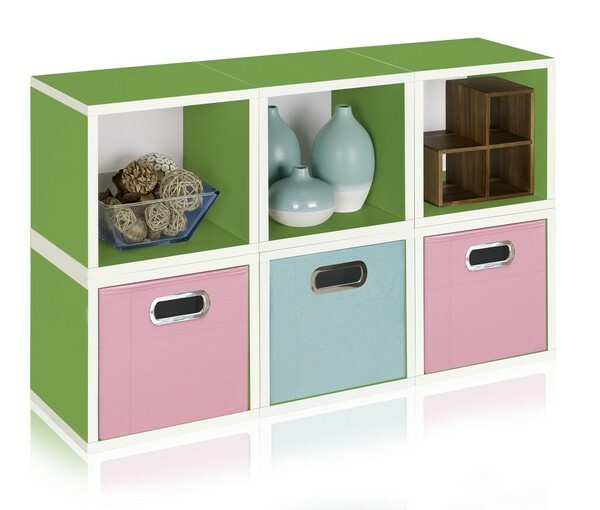 The cubes are individually assembled and positioned, so unlike any conventional storage unit in which you will have to stick with whatever design you bought, Way Basics gives you the power to change your configuration as your needs change , but that is not all, you can add additional cubes and rectangles as needed also. As I said, I was sent 6 Modular Cubes in white, but I needed a way to store all my daughter’s board games which I had in a toy box. Why? Because each time she wanted to play with a game, she would have to empty most of the things in her toy box to get to it or even find the right game. So I decided to buy a Rectangle Plus and was able to redesign my unit to fit her board games which are organized and now easy to get to! One other thing I love about this product? Way Basics products are formaldehyde free and VOC free so it’s safe for your family and our environment and they are a lot sturdier and stronger than I had anticipated! One thing I would recommend is that if you are placing them in a nursery or kid’s room, please keep in mind that the cubes are not attached to anything, so take measures to avoid any potential accidents! Also make sure not to place anything wet on top of your cubes. I added baskets and drawer labels to my unit and I couldn’t be happier with the results! The 6 Modular Cubes have a retail price of $120.00. 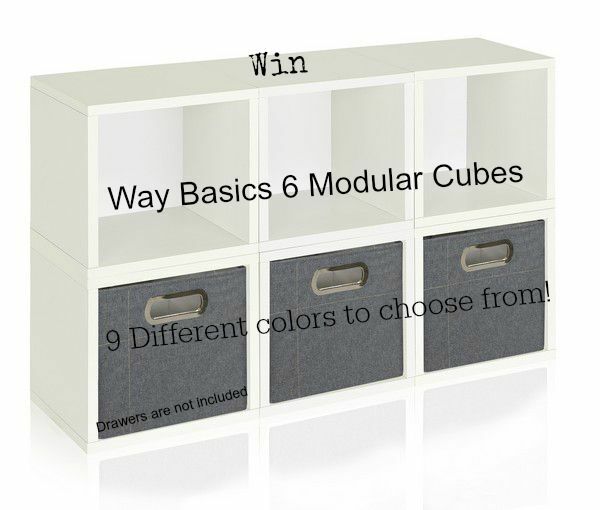 Way Basics has kindly offered one lucky Born 2 Impress reader the chance to win a free 6 Modular Cubes unit in the color of their choice! I think my favorite of their units is the Arlington in espresso. (But the Oxford is really nice too.) This is such a great idea for getting clutter off the floor! 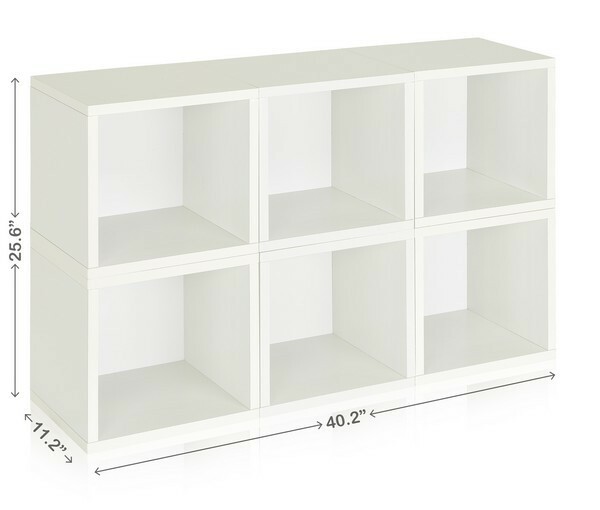 I like the Madison Bookcase – White. I love the Sutton, Espresso but all of them are so cool! My bedroom needs the most help! I really like the the Laguna unit in natural. I would love to have it for our spare room That is the room in my house that could use a little organizing. I love the Savannah Storage Bench. Most rooms in our home could use a little more organization, but my daughter’s bedroom is the worst! We just bought an RV and I need some compact storage options for it. We have a space in one of the two bedrooms of the RV where I need to store my grand daughters games, books, etc. and I think the Madison Bookcase – White would be perfect for that space. I like the Oxford Modular Organizer. The color I like it in ix Expresso. This piece would be nice for our mater bedroom. It would be great to hold some books. I like the The Sutton Shelf Media Console Cubby Bookshelf and Organizer. My house could use some organization in every room. But I think my bedroom is the worst. This would be so great to have. They have some really great products. I like the 6 Modular Cubes – Blue. I’m very much into symmetry and have passed that on to the kids. We are also a BLUE family. I love things in blue. I also think these would work well with some other organizational containers we have. I visited Way Basics. I like the Savannah Storage Bench. Both my son’s room and my bonus room need some organization. Way Basics has some great storage solutions. I especially like the Double Cube Plus – Espresso color for in my den we need storage space for all of our odds and ends and these would go great with my den furniture. I like the idea that these are so simple and stylish Thank you for sharing this review. I would love to have the Salinas Shoe Tower. I have a few pairs of shoes at the bottom of my closet. This would help me organize those shoes and get them off the floor! I love all of the cubes as well! I like the 3 piece storage bench in white. I need an organization plan for our summer/winter clothes. I would love to own the Madison Bookcase in Espresso and my bedroom/craftroom is the room that needs the most organization of all my rooms. Every room in my house needs organization, but any would help, I like the design of the Malibu Shelf, Espresso. My Grand daughter would love it in pink. I like the storage cubes the best. I really like having a pull out cube for ease in getting to my belongings. I love the wooden cubes in natural color the best 🙂 I really need some storage options, and I am so excited to learn about all these options. I like the Salinas shoe tower. Most of our rooms could use organization but mainly our mud room could. I love the Orange Rectangle Storage Cube/Bench. This would add just the right pop of color to make it fun and it could be used as a bench and allow enough room to hang thing above it. I like the Heritage Tower shelves. I’d love to use it to organize books and CDs in our spare room. My son and his family are moving to a new apt. 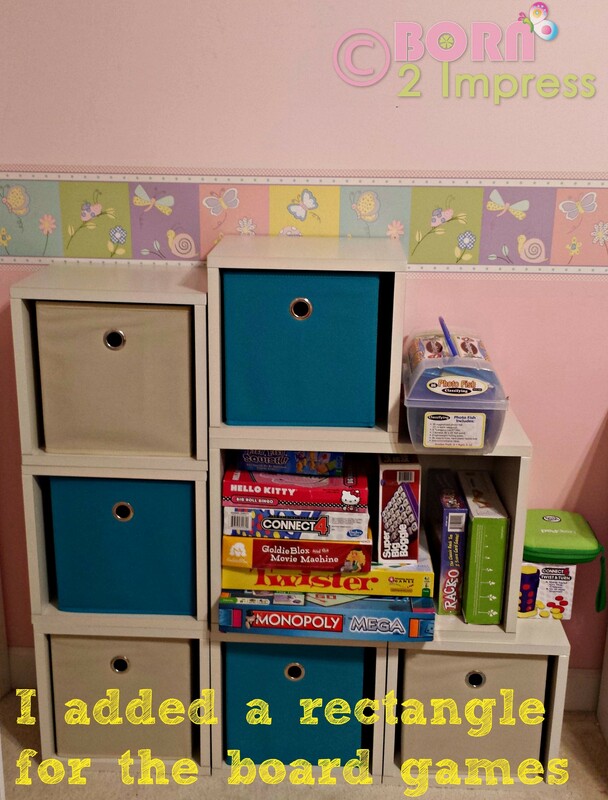 soon and my grandsons could definitely use the Madison Espresso 3 shelf bookcase to organize their games and many books they have. I like the multi level look, the separated compartments for so that each boy will have his space and the darker color. It would make a great addition to their room. I really like the Madison bookcase in black. I would love to have this for my bedroom. I like all of their units really, it’s hard to choose. Thanks for the chance to win! I like the Madison style bookcase in pink. It’s my daughter’s favorite color, and her room could definitely use some extra organization, especially for her books. I also really like the green units. I really like the Tribeca Book case in white. But not for books. ANd not for me. I just came from my daughters today…she has a 4 day old little sweetheart and I noticed in their Foyer , they have a ton of supplies for their baby and toddler. I’d love to see this there for all the daycare, travel, overnight, and other supplies they have in their entryway. She desperately needs to organize…2 bedroom with 2 kids and a lot of space there, but nothing to organize so many things for baby and 3 year old. Oh we need to organize toys in the family room! We spend alot of time there, but do not really have an organized storage place to put stuff. These would be so GREAT! I really love the Oxford Modular Organizer, Green/Orange/White (9 Modular Storage Cube and Rectangle Plus) ! I really like the Madison Bookcase – Black. I like it because it is eccentric and I think that it would look lovely in my living room! I really like the a symmetrical look to it. I really like this cube set, but would love to have it in espresso color to go with other furniture. I am in the process of re-doing a spare room to be Hubz’ study. Organization??? My goal for Hubz’ study is more like hiding places! My favorite is the Liberty Ladder Shelf in white! Honestly, all of our rooms need organizing. We just moved and it’s amazing when you find out that your furniture or systems just don’t fit or work in a new space. I like the Laguna, Espresso. It would be perfect to help us get our family organized. I think it would be a great way to store and display our dvds. I love the Savannah Storage Bench. My kitchen could probably use the most organization right now. I hardly have any cabinet space and could really use some storage space for all my kitchen gadgets. I have a bakers rack and a small shelf but I still need more space! I like the Connect Door Cube. Our place gets dusty easy and having a door help keep the dust out. My den / guest room need organization. We have surprise visitors often and need to be ready for them. I LOVE the Madison Bookcase – Black. The room that needs the most help has got to be our spare bedroom. I like the Madison Bookcase – Espresso. This would be great to put in my daughters room for her toys.